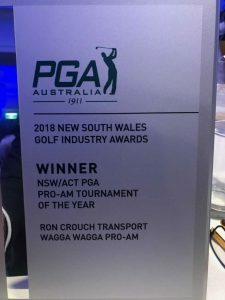 Wagga Wagga Country Club and Ron Crouch Transport are excited to announce that the Ron Crouch Transport Pro-Am has been awarded the Winner of the NSW/ACT PGA Pro-Am Tournament of the year. Congratulations to the Wagga Wagga Country Club, Pro-Am committee and volunteers for putting on such a fantastic event. We look forward to another successful RCT Pro-Am in 2019.